The Casio TC500 touch sensor calculator watch from 1983. It uses a capacitive touch screen for the calculator and function buttons. A calculator watch is a digital watch with a built in calculator, usually including buttons on the watch face. Calculator watches were first introduced in the 1970s and continue to be produced, despite falling from their peak popularity during the 1980s. The most notable brand is the Casio Databank series, though watches made by Timex were also popular. Most calculator watches contain only a few number of functions such as +, -, x, / and percents. However, there are several models with additional functions: scientific, including transcendent and trigonometry, in models Casio CFX-200, CFX-400, Citizen 49-9421, and also financial functions (in the Casio CBA-10). Usually calculator watch operates with eight digits number, however, calculator watch can operate with 6 digits (for example, Casio C-801) or 10 digits (Casio CBA-10) numbers. Another popular calculator watch was the Time Computer Calculator 901 which could perform basic arithmetic functions. The 902 model had additional functions such as percentage calculations. The Time watches carried a high price tag (US$4,000) due to being made of solid gold and were operated by a stylus pen owing to the small size of their buttons. Popular watches include those from Seiko and Citizen some of which had innovative functions. Japanese electronics company Casio produced the largest variety of watches. In the mid-1980s, Casio created the Databank calculator watch, which not only performed calculator functions, but also stored appointments, names, addresses, and phone numbers. The calculator watches made by Casio earned much fame due to their appearance in movies and also due to being celebriteis' choice during public events. 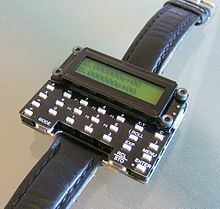 Mass-produced calculator watches appeared in the early 1980s, with the most being produced in the middle of the decade. Their popularity began to fade in the mid 1990s with the introduction of cheaper mobile phones and PDAs which could perform the same functions while being compact. The calculator watch is now a collector item and notable watches such as the Time watches and some special variants of Casio Calculator watches such as the CFX-400 command a high premium in the used market. The future of the calculator watch as a practical and useful electronic device has been impacted by the introduction of PDAs, mobile phones, and other powerful multi-functional compact computing devices. As a result, many calculator watches are used for aesthetic purposes. Nelsonic game watch - Multipurpose wrist-watches allowing the wearer to play micro video games, these units were the technological descendants of the calculator watch and were patented under calculator watch patents. Smartwatches introduced in the 2010s are similar to calculator watches in both aesthetics and functionality, even though far more advanced in capabilities. ^ a b Baguley, Richard (2013-09-20). "The Gadget We Miss: The Calculator Watch". Gizmodo Media Group. Retrieved 2019-02-20. Wikimedia Commons has media related to Calculator watches.